Myanmar leader Aung San Suu Kyi has scrapped plans to attend the United Nations General Assembly later this month, her spokesman said Wednesday, as the Nobel laureate faces intense global scrutiny over the Rohingya refugee crisis. "The state counsellor won't attend the meeting of the United Nations General Assembly," said government spokesman Zaw Htay, using Suu Kyi's formal title. The spokesman did not explain the decision but said the country's Vice President Henry Van Thio would attend the summit, which runs through next week. The announcement comes after the UN human rights chief, Zeid Ra'ad Al Hussein, accused Myanmar of waging a "systematic attack" on Rohingya civilians and warned that "ethnic cleansing" seemed to be under way. The UN's National Security Council also plans to meet Wednesday to discuss the crisis, which continues to deepen as the number of Rohingya refugees making it to Bangladesh soars to 370,000. They have fled violence that has torn through Rakhine state since August 25, when militants from the Muslim minority attacked police border posts triggering a major military crackdown. Suu Kyi, a Nobel Peace Prize winner for her defiant democracy activism under Myanmar's former junta, was once the darling of the international community. She made her debut before the UN assembly last September, after becoming former junta-run Myanmar's first civilian leader in decades, winning warm applause for her speech. 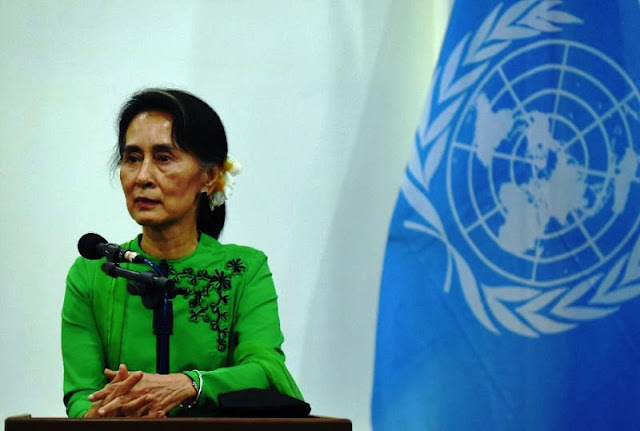 She vowed to find a solution to ethnic and religious hatreds in Rakhine "that will lead to peace, stability and development for all communities within the state." In a sign of how far her star has fallen since, she has been pilloried by the same rights groups that campaigned for her release from house arrest for failing to speak up in defence of the Rohingya. Several fellow Nobel laureates have also condemned her silence. Denied citizenship by Myanmar, the stateless Rohingya are loathed in Buddhist-majority Myanmar. Refugees streaming into Bangladesh have arrived with horrifying stories of indiscriminate killings and arson attacks at the hands of soldiers. While the US and other Western powers have rebuked the military campaign, Beijing offered words of support ahead of the UN Security Council meeting.